So what do we do on the day we find small hive beetle scuttling about amongst our bees? Surely the proactive thing is to ban all imports of bees before we get it because you know we can manage without Small Hive Beetle! So get to know where your bees have come from. Small hive beetles are easy to spot – apparently – running across the top bars of frames or scuttling across the floor so keep your eyes peeled. 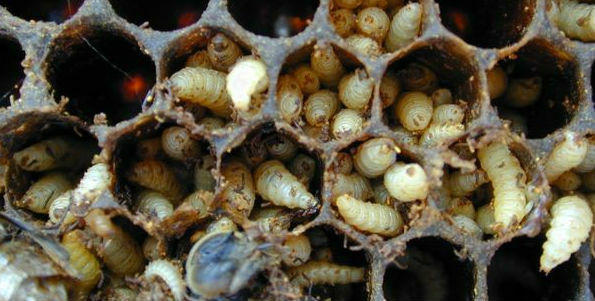 They will seek small spaces inaccessible to the bees so if you take a piece of corrugated plastic of cardboard and peel off one side then stick this – open face downwards – on the floorboard, you can make a simple beetle-harbour where beetles may seek refuge and be even more easily spotted. As for the maggot – they can be mistaken for the larvae of greater wax moth but whereas wax moth larvae have 4 pairs of feeble little legs, the small hive beetle larvae have 3 pairs of more business-like legs and their bodies are equipped with several sets of spines. Also SHB larvae spin no webbing. Infested honey has a wormy look to it and may be oozing slime. Click here for more on the life cycle of Small Hive Beetle. If you find small hive beetle, or think you have found small hive beetle – contact Ministry of Agriculture immediately. Some chemicals are available but are highly toxic and not very effective. On top of that they are almost certainly illegal here. Also, the beetles complete their life cycle in the soil so that needs to be turned over up to 6 foot from the hives and drenched with yet more chemicals. Permethrin is used in America but it is also extremely toxic to bees so cannot be sprayed on – instead it has to be watered in using a watering can or similar. If you don’t want to use chemicals – you can try your hand at trapping. In America various beetle traps are available – they mostly seem to consist of a reservoir of oil inside some sort of bee proof container with entrances for the beetles. Beetles will enter to seek refuge from the bees then fall into the oil and drown. Traps seem to catch a number of beetles but they will not eradicate the problem – they just help to keep the numbers down and may prevent a severe infestation. Prevention is better than cure and good beekeeping practices are recommended. Another wise method of prevention would be to ban the importation of bees – because that is how it will get here. Click here for more on that. Look for bees with hygienic traits and breed from these. Above all – NEVER – import bees!